Just a quick update on the belly. 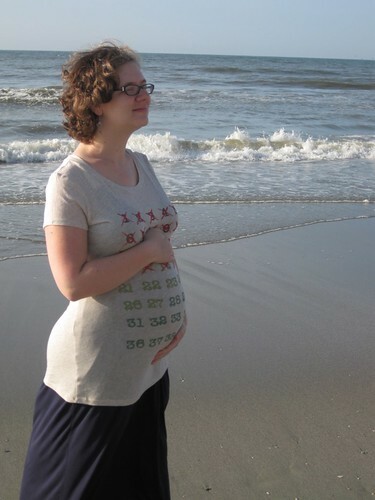 Here’s my 20 week photo from Myrtle Beach. I’m 23 weeks today and the belly has really been growing fast! Will post another picture soon. 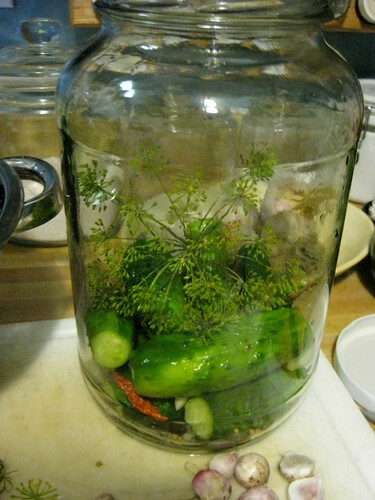 This weekend we had a lovely pickling day. It was overcast and cool which made it a perfect day to have the canning pot steaming. 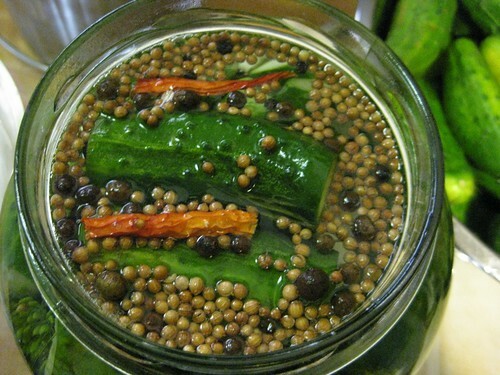 I have never grown my own pickling cukes. We go down the road to the farm and get a 10 pound bag. The nice thing about this is all the cucumbers are close to the same size, fresh and ready for pickling. Last year, we fermented all of the 10 pounds using a recipe from the Ball Complete Book of Home Preserving . This year, we have discovered Linda Ziedrich’s books and they are now my favorite canning books. 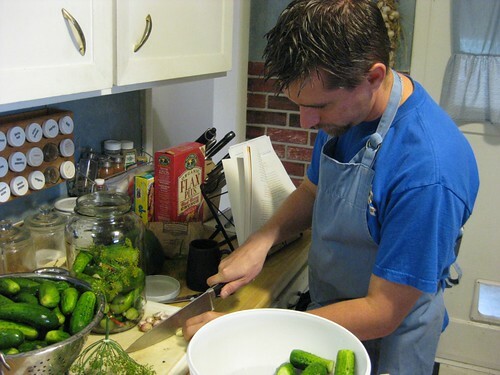 We put together 4 pounds of cucumbers to be fermented using the upper east side full sour pickle recipe. Did I mention I love this book? These recipes came from The Joy of Pickling but we have also tried several from The Joy of Jams, Jellies, and Other Sweet Preserves . Overall, our success rate from this and her jelly/jam book has been much higher. I love the ingredients she uses. 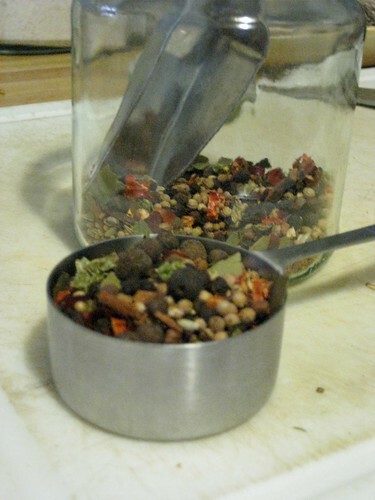 Plus, we didn’t have pickling spices, and of course, she includes how to make your own. Making it completely customizable. The rest of the pickles were processed using a recipe from our local newspaper: Damn Good Garlic Dills. Most of these were processed, and a few jars were placed in the fridge ready to be eaten as soon as we finish of the few jars left from last year. oh, I love myrtle beach! We went this year for spring break. I hope you guys had an awesome time (I’m sure you did). Also, I’m sorry we didn’t get down to see you, but we never ended up heading south. There’s too darn much to see in Oregon, and Matt wanted to visit lots of mountains. congrats on being pregnant! you look great!! i ate a lot of pickles while i was pregnant too – i bought a huge jar of them at costco!